From welcoming new residents to adding programs, there’s always something new to see or do. Next time you visit, keep your eyes open for these species. Some are excellent at blending in, so it may take a while to spot them. This lizard is considered a dietary generalist, eating plants, seeds, fungi, insects, spiders, mollusks, birds, mammals, fish, amphibians, other reptiles and even carrion (dead animals). 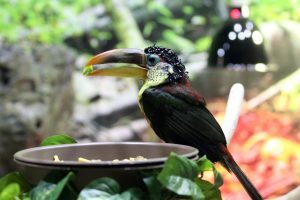 This fruit-eating, tropical bird is named for its unique, shiny, black head feathers and is closely related to toucans. 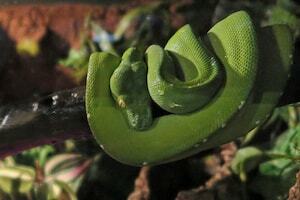 Usually found coiled around a tree branch, it is born yellow or maroon and changes color 6-8 months after birth. The frog’s name stems from indigenous humans using their deadly poison to coat hunting arrows and darts. Its weedy appendages help it blend in to the seagrass. 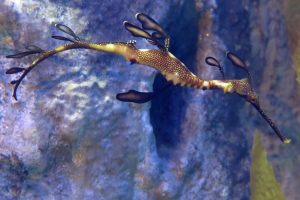 Like its relative the seahorse, the male carries fertilized eggs until they hatch. 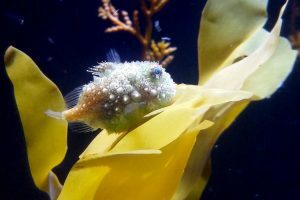 A poor swimmer, it uses modified pelvic fins to suction onto to rocks and kelp. It’s covered by cone-shaped plates called tubercles for protection and camouflage. 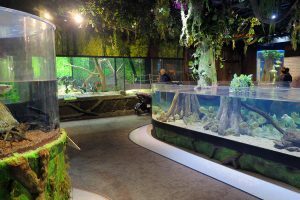 The Asia & Indonesia gallery features a wide variety of aquatic species from both regions and the entire gallery has been re-themed according to the regions’ architectural heritage and wildlife. Much of the remodeling was done in-house using repurposed and upcycled materials. 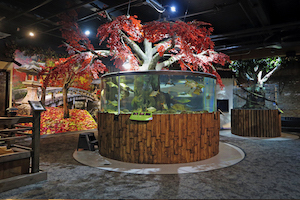 After visiting our Aquarium, our younger guests now have the opportunity to imagine and create one of their own. 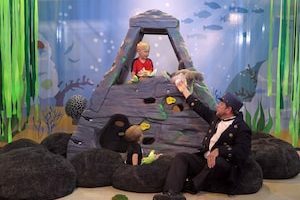 The new Imagiquarium pretend-and-playspace, located next to the Nautica Café on the second floor of the Powerhouse, features a variety of activities inspired by what our team does every day. Children are invited to explore careers involved with marine life and picture themselves as an aquarist, diver or marine biologist through hands-on fun. You’ll notice a burst of color within our Tropical Forest gallery when you catch a glimpse of the Curl-crested Aracari. 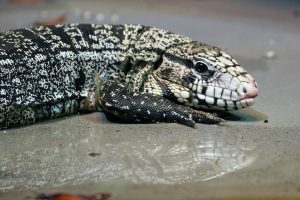 These beautiful birds call an Argentine black and white tegu (a lizard that can grow up to 4 feet!) their neighbor. 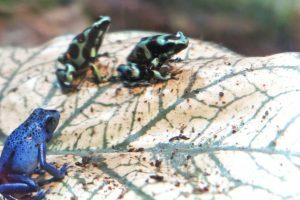 Glance over to the Amazon and you’ll see piranhas sparkle, poison dart frogs jump and an ocellate river stingray keeping its eyes on things from all directions.